Apple has become a unique company in the last 4 decades. Although of completely different industrial sectors it can be compared with the German company Porsche. Both are focused on a few products with the highest possible build quality. All their products simply do what they are intended for without bells and whistles (well-known from Asian manufacturers). They just work over many years resp. decades. Each new product iteration brings remarkable value. 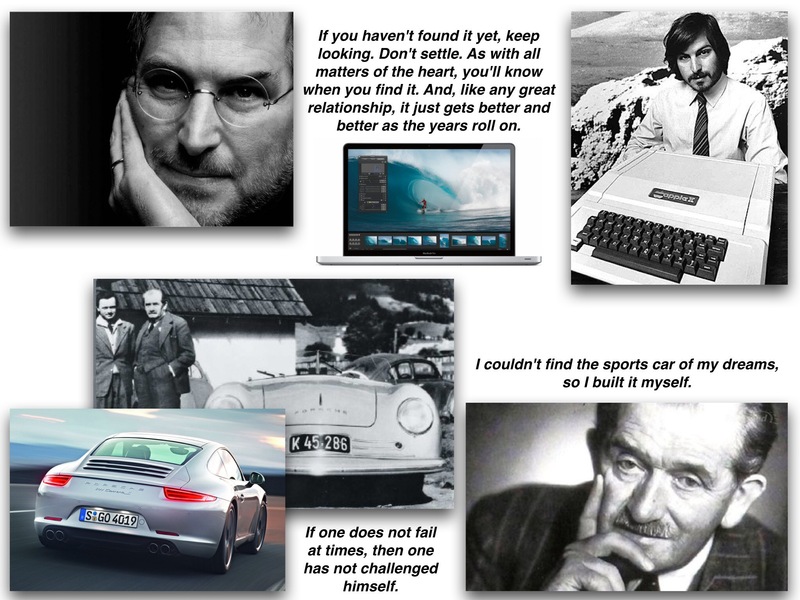 Steve Jobs and Ferdinand Porsche are well-known for their restless efforts to find something new or make people excited. After many throwbacks both visionaries became successful business men and both founded brands admired all over the world regardless of different cultural backgrounds. Steve with his iPhone and Ferdinand with his sports car 911 created a new market and both products were continuously updated until today. Both initiated a shift in paradigm regarding mobility, Steve with the iPhone and the iPad and Ferdinand with the Volkswagen. was an automotive engineer and honorary Doctor of Engineering. He is best known for creating the first gasoline-electric hybrid vehicle (Lohner-Porsche), the Volkswagen Beetle, and the Mercedes-Benz SS/SSK, as well as the first of many Porsche automobiles. Porsche designed the 1923 Benz Tropfenwagen, which was the first race car with mid-engine, rear-wheel drive layout. was an American entrepreneur, marketer, and inventor, who was the co-founder (along with Steve Wozniak and Ronald Wayne), chairman, and CEO of Apple Inc. Through Apple, he is widely recognized as a charismatic pioneer of the personal computer revolution and for his influential career in the computer and consumer electronics fields, transforming “one industry after another, from computers and smartphones to music and movies”. Apple makes very few products – Cook once said its entire range could fit on a tabletop – and they are more expensive than the competition. So how has it become one of the biggest companies in the world? It has done so through the power of mystique, aspiration and industrial design; through, in short, the narcissistic, brutally competitive aesthetic obsessiveness of Steve Jobs. Apple continues to be formidably profitable – its stores, for example, have the highest sales per square foot of a retail outlet in the world. Yet Apple is not a viable business model: it is, like Jobs, an unrepeatable corporate freak show. Can it possibly be, post-Jobs, a freak show that runs and runs? The reviews are not yet in but doubt is priced into the shares. Given the number of full-time Apple watchers in the world, you’d think that somebody would know – but nobody does, not even, thanks to the company’s internal as well as external secrecy, most of its employees. Products are developed in closed-off rooms entered only by those who need to know. The one small peephole in this wall of silence used to be patent applications, which are public documents. Apple’s used to be scanned for what would come next but now the company patents everything, even abandoned ideas, so there is no knowing which are the real possibilities. However, when the watchers converge on a forecast, it tends to have at least a grain of truth. Currently, they say, an iPhone with a much larger, curved screen and pressuresensitive touch controls is on the way. But that simply augments the current product. Two possible and entirely new products could restart the company’s sigmoidal curve. “I’m pretty confident that they have at least two more technologies,” says Leander Kahney, editor of the Cult of Mac blog and author of a new book about Jony Ive. Bryan Appleyard was educated at Bolton School and King’s College, Cambridge, graduating with a degree in English. He was Financial News Editor and Deputy Arts Editor at The Times from 1976 to 1984. Subsequently he became a freelance journalist and author. He is a three-time Feature Writer of the Year award winner and has been commended four times in the British Press Awards. Yes, this is one of the biggest vehicles for change because it raised the bar on handheld social media, on internet in your pocket, and on the spread of digital photography. The ability to make a difference was propagated with the iPhone and the devices that copied it. Did Steve Jobs know he was starting this kind of change? He knew it was transformative. And he built ecosystems like iTunes, the App store, and the iBookstore to make it all work. Without the App Store, we’d all still be in the dark ages of social media. The mobile revolution is here to stay. Holding the first iPhone was like holding a bit of the future in your hands. It was that far ahead of the pack. Its amazing glass keyboard was met with skepticism from analysts at first, but the public was quick to decide it was just fine for them. A phone that was just a huge glass screen was more than an innovation. It was a revolution. Each new iPhone iteration brings remarkable value. Better telephony (3G quickly became 4G and that quickly became LTE), better sensors (accelerometer, GPS, magnetometer, gyrometer, etc. ), and better camera, lenses, flashes, and BSI sensors. Bluetooth connectivity makes it work in our cars. Siri makes it work by voice command. Each new feature is so well-integrated that it just feels like it’s been there all along. Now that I have used my iPhone 5S for awhile, I feel like the fingerprint sensor is part of what an iPhone means, now. This all-in-one device has led to unprecedented spread of pictures. It and its (ahem, copycat) devices supporting Google‘s Android and more recently Microsoft‘s Windows Phone 8 have enabled social media to become ever more present, and influential, in our world. You want to purchase a device which supports the usual tasks done by the majority of smartphone or tablet users? Well, visit a shop and just buy one made by Samsung, HTC, Sony, or any other company. But if you want more than just an intelligent assembling of standard electronic components you should buy artwork designed in California, more precisely in Cupertino. Here are my reasons when I decided to move from a 30$ Nokia telephone and a Siemens Convertible to an Apple iPhone and an iPad. The devices simply support me when blogging, creating mind maps for myself or the company, and accessing synced content on either the iPhone or the iPad by just switching iCloud to ON. I’m no longer bound to a work desk and my brain is no longer plugged into a computer. Whether there is an idea in a coffee shop, on the sofa, or in the office, it immediately is moved into the device without booting it. After decades of configuring computers, updating virus scnners, installing Microsoft patches, watching blue screens, endless reading of knowledge base articles about failing drivers I got tired to see the machines stealing valuable time of my life. I needed a period of reflection without taking care of all the technical little helpers. They should support me when doing essential things and not spoil my enjoyment of being creative. Slightly different from Neill Armstrong my upgrade from a 3GS to a 4S was a “One small step for mankind, one giant leap for me”. I don’t need a new device every year because my tasks basically don’t change. But it helps to see improvements in doing things even more user-friendly than before. 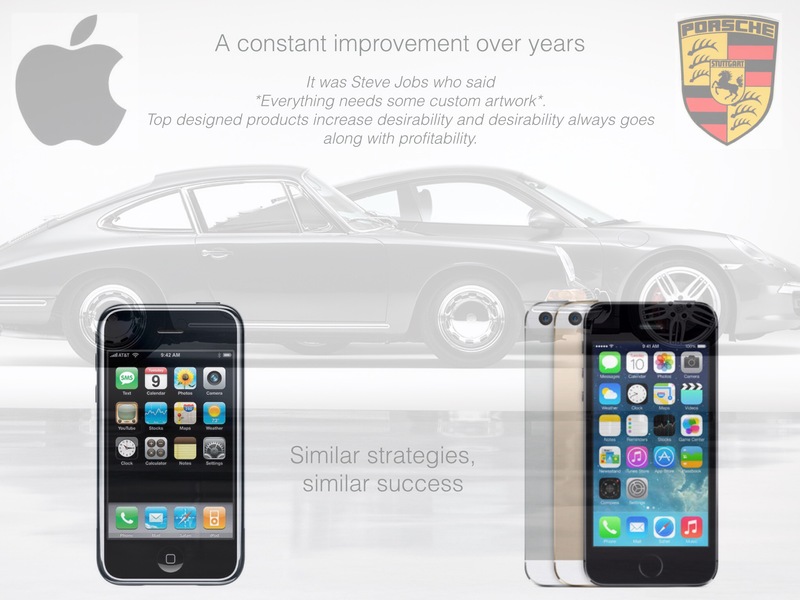 The same strategy can be found when looking on an other admired company, Porsche. Perpetual improvements on their 911 flagship made the company to one of the most valuable brands in the world. No bells, no whistles, no new eye catchers every year but a product with constantly growing value and suitability for daily use. Engineers took care of the many details to achieve success. I alteady bought the first available computer in Germany, it was a Sharp MZ 80K, driven by a Zilog Z80 processor with cassettes as the main storage. It was a device with advanced product quality and that’s what I again found with Apple devices. They are solid, feel valuable, and look like pieces of artwork. In contrast to all the other companies in the fiercely competitive mobile market, Apple is cult, like Ferrari or Porsche. The whole world talks about the company and it’s importance comes up every day when users owning other devices again just talk about one topic: Apple, positive or negative. There is a company-DNA and blood flows through the prominent veins of responsible employees. They are VIPs on stage, we know their names, parts of their biography and philosophy. We can feel their intention when using one of their valuable devices. There is a well-considered ecosystem. There is a company which reminds us if one of the top influencers of our times with a role function for all of us dies. I’m talking about Neson Mandela. There is a company strongly supporting the educational sector and a company which initiated a shift in paradigm of learning, teaching and mobility. and Apple’s official video about the company’s intention where “simple phrases with elegant visuals describe the thoughts and emotions that go into creating each Apple product”. There are a thousand no’s for every yes. All employees of a company know what they do, and some know how they do it, but most of them don’t know why they do it. Apple’s competitors lead with messages about what they sell, but their leaders do not communicate why they do what they do. People don’t buy what you do but why you do it. Almost from the beginning, with Jobs and Wozniak, Apple told you why it developed the Apple II – to create a more affordable computer. When Jobs introduced the Mac, he said he believed that computers were too boxy, unexciting, and difficult to use. If you watch the famous 1984 Apple Super Bowl ad you’ll quickly realize Apple believed it was breaking the mundane tyranny of the boring PC and creating the next computer for the Everyman. It had new graphical user interface, mouse drawing software, and was fun to use. He invited customers to follow him away from the stodgy old PC and into the new world of computing. Jobs started attracting new converts. Sure, most business stayed with the PC, but those who believed in Jobs’ vision followed him. He often uses the term “I believe” in his speeches at product launches as he preaches things like, “I believe people want products that are easy to use, and always work.” Every chance he gets, he shares his vision – the why that drives him and Apple forward. Watch Apple’s iPad ads closely. Unlike HP’s TouchPad ads that glorify stars, Apple’s simply show you what you can do with its products. People follow leaders or buy products they believe in. Apple knows that the vast majority (including me) is not necessarily interested in tweaking products for more personal customizations or they want to get rid of an ongoing personalization which, after some times, often leads back to the original state. It takes some time to internalize that using a device is more valuable than configuring it. The iPad ads convince you that it is elegant, easy to use, and will meet your needs as is. People are not only buying Apple products because they are great, but because they are also buying into Apple’s vision of why. They believe in the same vision and want the benefits that this vision gives them. I suspect Apple will continue to gain even more converts who also believe, like Steve Jobs, that tech products should make their digital lives richer. They relate to what the products do for them and are willing to follow Apple since they have adopted its vision for themselves. It’s #4, #5, and #6 that let me buy Apple devices. Admired leaders, a unique strategy not driven by market shares, and a consistent ecosystem makes the difference. I don’t like bloodless companies just looking on market share, stealing ideas, and claiming to be innovatove without being so. Market shares have never been indicators for quality, innovation, or usefulness.